Details: Cycling Centre staff will greet you at the Phoenix airport and transport you and your gear to the Civana Resort. While you enjoy lunch by the pool and check-in to your room, your bike will be assembled by the Cycling Centre Team. After a late afternoon spin we'll have a short shuttle for a social dinner. Details: ​We'll stop at Local Johnny's for lunch before heading back to the resort. Afternoon activities are abundant at the resort with yoga or an exploration of the desert, for a sample of activities offered each day click here. Massage is scheduled and time by the pool or fire pit are a fun way to socialize with the group before heading out for a local dinner. 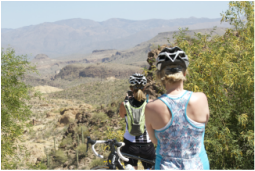 Ride Description: This NEWLY paved route offers breathtaking views around every bend. 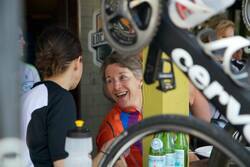 The long option is to ride from the resort to Tortilla Flat, an epic 150 km option and shuttle home. The shorter option is an out and back along the awe-inspiring curvy route. A break in the charming town of Tortilla Flat is a must, with unique and humorous sites abounding. Be sure to sample the prickly pear gelato! Details: ​The shorter group will be shuttled 60 minutes to the start. Both groups will meet at the end as we have lunch at the Hitching Post, a local watering hole where the locals arrive on horse back. All riders will shuttle back to the hotel for some R&R before dinner. Ride Description: This ride has a challenging start as we ride uphill on a 4% grade but then the ride down to the lake is absolutely stunning! The out-and-back route allows everyone to ride at their own pace. The ride out of the lake is a 16 km climb; finding a rhythm and enjoying the spectacular views is key to enjoying the day. The long route has the options of adding on out-and-back sections from the 60 km route. Details: ​Riders can choose to have lunch at Raven's View on the long route, in town or at the resort. 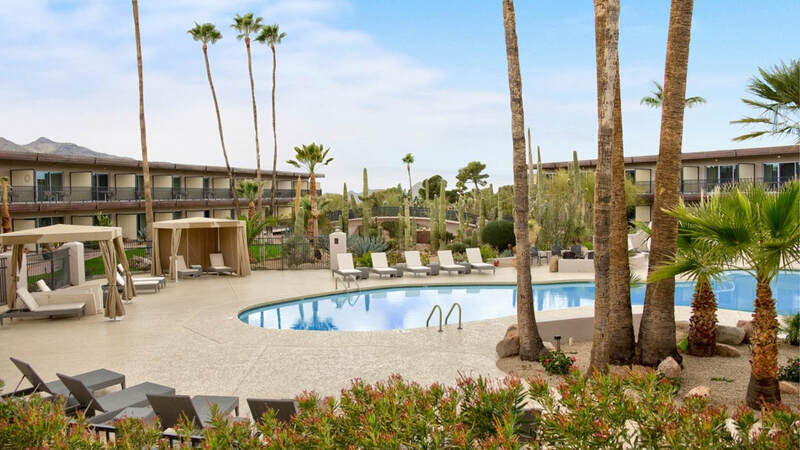 Afternoon activities include a massage, time by the pool, a run, or exploring the wild west offerings of Cave Creek and Carefree, before a group dinner. 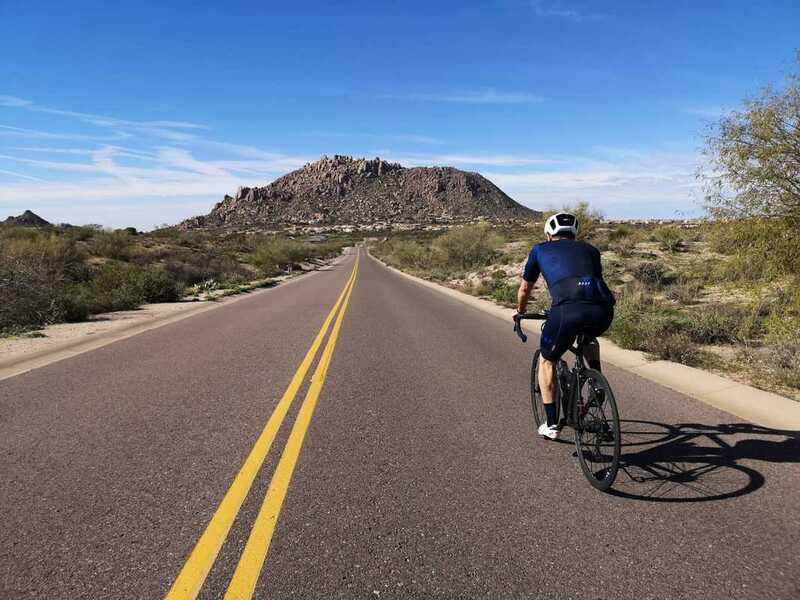 Ride Description: There are options today including a day off to do what the heart desires; maybe shopping at the beautiful outdoor malls of Kierland Commons and Scottsdale Quarter, or a day on the golf course (there are many to choose from). The riding options include a leisurely tour of Carefree or the road up the infamous Mt. Humboldt with some dirt roads leading up to the base of the mountain; the 10 km climb over 10% has been paved since our last visit. Both routes have spectacular views of the surrounding mountains. ​Riders can add on by dipping in to Bartlett. Details: ​We'll end the rides by the pool and recap our adventures. The afternoon will have time to explore town with it's unique western flare, participate in a stretch or foam roller class, swim in the lap pool, or enjoy a book in the sun. Dinner will be an enjoyable feast at a local restaurant. Ride Description: There is a little bit of everything on this ride! The route starts with a slight descent to warm-up the legs with the routes separating at the 15 km mark. 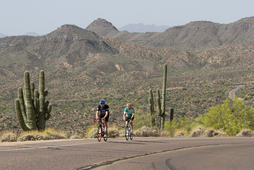 The shorter option is relatively flat while the longer option has some fast rollers, then heads in to the Scottsdale suburbs where riders are faced with an 18% hill; a great challenge that is rewarded with spectacular views before a fast and fun 20 km descent! Details: ​Airpark Bike Shop is on the long route and a 10 km roundtrip deviation for the shorter route should riders choose to check out some bling. We will pass the Grotto Cafe on the way back to the hotel, a good place to stop for lunch. Dinner will be a social final evening together to share our tales of adventure.